Today’s post comes from Brendan Dolan, Project Archivist for the Archives of Irish America at the Tamiment Library. Brendan holds an MA in Irish Studies from NYU and has been working on the Mick Moloney Irish-American Music and Popular Culture Collection since January 2009. If you have a chance, come visit the Tamiment reading room and take a look at two music-themed exhibits that I recently and very happily installed. The exhibits highlight two collections from the Archives of Irish America, which are part of Tamiment Library: the Mick Moloney Irish-American Music and Popular Culture Collection (AIA031) and the McNulty Family Collection (AIA051). 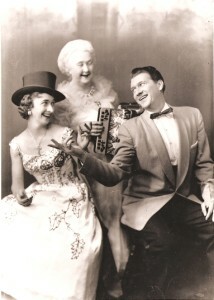 The McNultys were the top Irish-American music act in the U. S, from the 1930s through the 1950s. 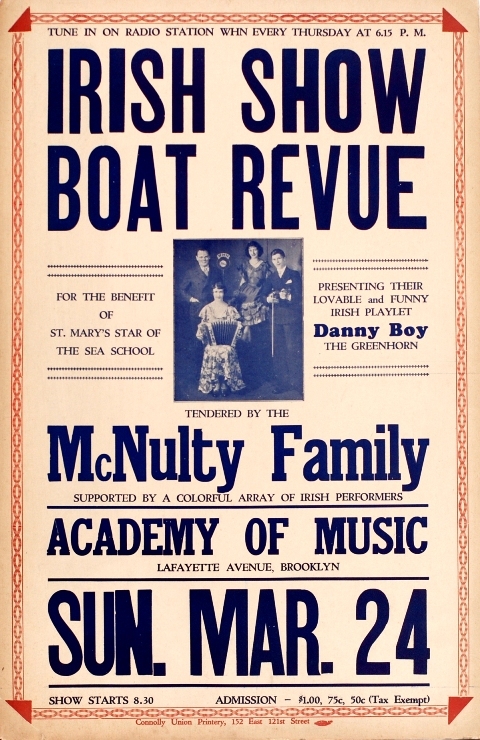 Trained on Vaudeville stages and billed as the “Royal Family of Irish Entertainment,” Annie “Ma” McNulty (1887-1970) and her singing and dancing children, Eileen and Pete sold out the Brooklyn Academy of Music annually with their Irish Show Boat stage review for two decades. With over 150 recordings on Decca and other labels, they single-handedly established the musical repertoire for the Irish-American community until Pete’s tragic death in 1960 at the age of 43. The McNulty collection contains materials collected by the larger than life “Ma” herself, who seemingly amassed every printed reference to and advertisement for her performing family from the 1920s on. These clippings are supplemented by photographs, television and record contracts, correspondence and a host of handbills and show programs. There are also items of great musical interest, including sheaves of original arrangement manuscripts, handwritten lyric books, scripts for the family’s stage and radio shows and over thirty marquee posters. I selected and reproduced to scale five of these vintage posters for the exhibit in Tamiment; they illustrate the variety of venues in which the McNultys performed and I think give a feeling for the kind of cachet this group once had. I am eagerly looking forward to working with Eileen McNulty’s daughter, Pat Grogan, who will be coming to NYU in August to help process the rest of the collection. Several parts of the Mick Moloney collection are now open for research and the exhibit in the Tamiment reading room displays a sampling of its colorful artifacts and provides a brief introduction to Moloney himself. Co. 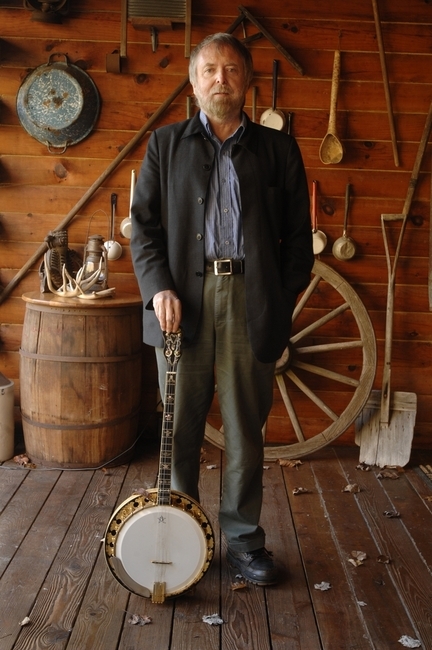 Limerick native, Dr. Moloney achieved early prominence with an influential Irish folk group, the Johnstons, before immigrating to Philadelphia in the early 1970s to pursue a doctorate in folklore from U. Penn. Moloney, who is now Global Distinguished Professor of Music and Irish Studies at NYU, has since become one of the leading experts on Irish music in America accruing a massive personal collection of Irish Americana which is now in the Archives of Irish America at Tamiment. 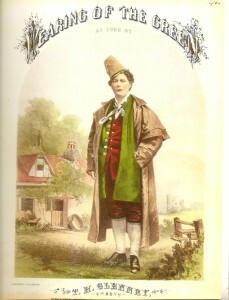 The Moloney collection contains around 1500 pieces of sheet music, some dating back to 1817, as well as dozens of 19th and 20th century songsters. Together with the nearly 800 postcards, tobacco cards, illustrations from Puck and Harper’s Weekly and assorted advertisements, the materials present a visually rich record of nearly two centuries of Irish-American experience. If you’d like to see more, I recently created a Flickr version of the exhibit as well, which you can access through Tamiment’s website or the NYU Libraries Special Collections and Archives page. I hope you enjoy. There is a lot more to the Moloney collection and I will post again about that in the future on the Back Table. I met Mick at The Annie McNulty Awards at the Knockcroghery Singers Festival in 2007 and the McNulty family are related to my wife, so I want to wish you the very best in your efforts! Great to see archives preserved and available for study. Well done. Well done and congratulations. Two excellent subjects. This is lovely to see documented at last. Annie McNulty is my Great Grand Aunt and her birth place is just a few hundred metres from my family home. Pat Grogan visted it in 2007. Good luck with your work and we look forward to following its progress also. for their work in preservsing the legacy of Irish music in America. The McNulty Family Collection has thankfully been kept together through the efforts of Annie McNulty herself, her daughter, Eileen and Eileen’s daughter, Pat Grogan. As a columnist for the Irish Echo, I interviwed Eileen in 1979 and she joyfully recalled the days of the Irish Show Boat performances and many summers entertaining the throngs at Rockaway Beach. I am so delighted to see this collection properly cataloged and archived at NYU! After hearing the McNulty’s on the radio in the 1950’s, I started to collect their records and now have them all. I still use their records on my radio show here in Rochester NY, now in its 35th year. I was honored to give my first lecture on the McNulty Family at the Annie McNulty Awards in Knockcroghery in 2006. An article based on my lecture will be published in the Journal of the Society of American Music in the fall of 2010. 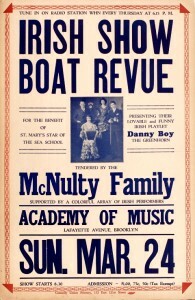 The McNulty’s were an extremely talented trio; I only wish I could have seen them perform live. I love hearing about musical acts from the past. It’s very interesting to think about music in a historical context and to consider the times culturally and politically when the songs were released. The entire original Heslin Family was raised on the McNulty Family records purchased through the Mrs Mattie Haskins Irish store which I believe at that was on Third Avenue. Sunday and Tuesday evenings were reserved for Irish Music on the radio. 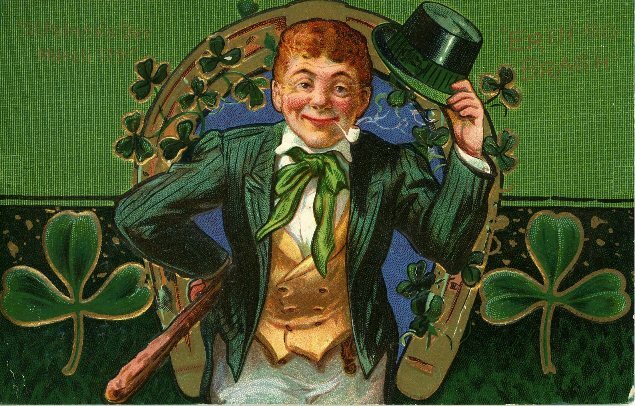 One night the Irish Music Show was from Chicago on WCFL, the Voice of Labor in the Greater Chicago area.The other night the Irish Music was from NYC. Each show ran 1hr. Where can you purchase McNulty CD’s or tapes now? saw the show last night. for me it was a very emotional night. Ever since i saw pete and eileen at the leitrim house in rockaway i have always held a special place for them in my heart. the memories are very, very special. Some day we will meet and i will share the experience and a few stories with you. thanks for a great night. Thanks for the positive review! We are very happy you enjoyed the night and that you and the rest of the audience could help us honor the McNultys in the way they deserve – there was a great buzz from the audience and it helped make the night extra special. And John, the only place I know that sells the McNultys on CD right now is Rego records – their web site is easy to find. I know that Mick Moloney and Harry Bradshaw have been working on an anthology and hopefully that should be out within the next year so keep your eyes peeled for that as well. Thanks again to all for your comments! I live in London but my mother’s family in Ireland had a huge collection of the McNulty family’s records and we used to listen to them during our summer holidays in Ireland in the 1960s. When I heard about the concert my sister and I and two cousins flew from London and Chicago to New York to attend. It was well worth the journey. We had a wonderful evening with a sell out show and a marvellous atmosphere. It was a long way to come but the show didn’t disappoint. Looking forward to Mike Moloney’s anthology.